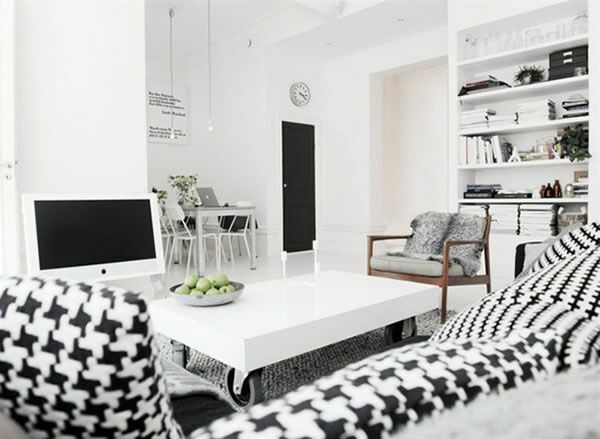 In this post we would like to showcase a fabulous “1,5 room apartment” which brings tribute to Scandinavian design. This highly functional crib stretches over a surface of only 42 square meters, yet it does not seem to lack many things. The living room is airy and bright with windows looking out onto the quiet neighborhood. During the last renovation, the living room and kitchen were united, which contributes to an overall feeling of space. A rustic brick wall acts as a “decorative” border between the two rooms and ensures a high level of originality. The walls are painted in a white hue that provides a neutral base for decorating. Beautiful color contrasts are achieved by the gray sofa and flooring. To the left of the hall and directly adjacent to the living room, an extremely convenient and comfortable sleeping space can be observed. Two of the walls are painted in white, while the third is a beautifully patterned wallpaper in pleasant tones. This special alcove is greatly appreciated in a crib of this type, giving the feeling of a perfectly planned small apartment.